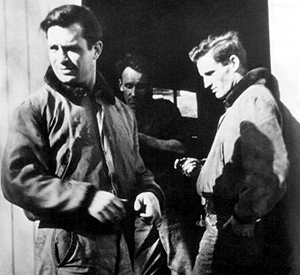 Jack Kerouac’s book On the Road is a classic of American literature. Kerouac writes about his experiences in Cheyenne, Wyoming, during “Wild West Days” on his way to Denver via Longmont. The movie melds historic literature, still images and interviews with members of the next “beat” generation, including John Allen Cassady, son of Neal Cassady, who reads the part of Sal Paradise and juxtaposes them with 2009 video of Cheyenne Frontier Days and interviews of “beat” literature students from New Vista High School in Boulder. That’s how Kerouac described the outskirts of Cheyenne in July, 1947, from the back of a pickup truck traveling from Nebraska, probably on the Lincoln Highway. After his crazy night in Cheyenne, Kerouac (Sal Paradise) hitchhikes to Denver to meet some rowdy, free-living friends waiting out the post-World-War-II slump in the Mile High City. His pals include a Columbia classmate named Allen Ginsberg (Carlo Marx) and Neal Cassady (Dean Moriarty). The project was produced in collaboration with the Naropa University Jack Kerouac School, the Wyoming State Archives, the Del Rey Restaurant, the Crown Bar, the Albany Bar, the Mayflower and the Plains Hotel. “On the Trail: Jack Kerouac in Cheyenne” is a entered in the Wyoming Film Office short film competition. Help it win! Open the link, view the movie, then rate it by clicking a star under the video player. The top 10 are decided by audience vote and the winner is picked by a panel of judges.